I went to Antarctica in the Spring expecting to have a complete holiday from the Regency. When we sailed past Coronation Island in the South Orkney Group I assumed it was named for Queen Victoria’s crowning, or even a later monarch. But no, this island (one of three so named worldwide) commemorates George IV and was named in December 1821 by two very early Antarctic explorers, the sealers Captain Nathaniel Palmer (American) and Captain George Powell (British). Either news was reaching south very fast or Powell, knowing when he had left British shores that George had become king in 1820, named the island retrospectively. He certainly claimed the South Orkneys in the name of the King – quite how much discussion about that went on with his American colleague is not recorded! If Powell was hoping for royal favour he unfortunately did not live to receive it, dying in Tonga in 1824. Back in London on 19 July 1821 George IV was crowned in one of the most magnificent, and completely over the top, coronations in British history. The entire day was too packed with incident for one blog post – not least the dreadful spectacle of the distraught Queen trying to gain admittance to the Abbey – so I’ll just concentrate on the procession itself. The print I am working from was published on July 24th, just three days after the coronation, and the artist is giving the view from approximately what is now the bottom of Whitehall looking out over the modern Parliament Square in the right foreground and New Palace Yard on the left, now enclosed by railings. The Thames can be glimpsed to the left and Westminster Bridge is beyond the large tree. I have had to scan the print in halves because of its size. It shows clearly the covered processional way (coverings not shown in order to reveal the participants) weaving its way from the front of Westminster Hall on the left, snaking round the gardens in front of St Margaret’s Church (in front of the Abbey with the Royal Standard flying from its tower) and disappearing from sight before its entry at the West door of the Abbey. The procession started half an hour late at half past ten in the morning and was headed by the King’s Herb-Woman and six attendant maids scattering sweet-smelling herbs and petals. Behind them came the chief officers of state, all in specially designed outfits and carrying the crown, the orb and the sceptre, preceded by the Sword of State and accompanied by three bishops carrying the paten, chalice and Bible to be used in the ceremony. The peers in order of precedent, splendid in the robes, followed next and those Privy Councillors who were commoners had their own uniform of Elizabethan costume in white and blue satin. The King wearing a black curled wig and a black Spanish hat with white ostrich feather plumes had a twenty seven foot long train of crimson velvet spangled with gold stars and walked to the Abbey under a canopy of cloth-of-gold carried by the Barons of the Cinque Ports (also in special outfits). Music was provided by the Household Band. After the ceremony, at four o’clock the King, now very weary, walked back to Westminster Hall and the great banquet served to three hundred and twelve male guests. Ladies and peeresses, who were not served any refreshments, had to watch their menfolk gorging themselves from the massed galleries that had been built inside the Hall. Amongst the food were 160 tureens of soup. 80 dishes of braised beef, 160 roast joints, 480 sauce boats, 1,190 side dishes and 400 jellies and creams. The climax of the banquet was the arrival of the King’s Champion, in full armour, mounted on a white charger. The Champion threw down his gauntlet three times, but no-one stepped forward to challenge the King who toasted his Champion from a gold cup. Possibly the medieval glamour of the moment might have been diminished if people had realised that the Champion, from a family who long held the hereditary position, was actually the twenty year old son of a Lincolnshire rector and his charger had borrowed from Astley’s Amphitheatre. The Champion’s stable is visible on the extreme left of the print. In 1717 the 2nd Earl of Oxford, Edward Harley, began work on the development of his estates north of “the road to Oxford” or Tyburn Road, that eventually became Oxford Street. The first element in his grand design was Cavendish Square, named for his wife Lady Henrietta Cavendish Holles. The Duke of Chandos bought the entire northern side for a mansion (described by Ackermann’s as a ‘palace’), Lord Harcourt and Lord Bingley bought sites on the east and west and the rest was sold to speculative builders. Work was interrupted by the financial crisis of the South Sea Bubble in 1720 but the Earl persisted, developing streets and Oxford Market to stimulate interest in his scheme. By the time of Roque’s map (1738) there was significant development on all except the North side. Marylebone Bason, a reservoir, can be seen to the north west and what is probably a gravel workings to the north east. Oxford Street can just be seen at the bottom.Lady Mary Wortley Montagu (poet, letter writer and pioneer of smallpox vaccination) lived at number 5 1723-38. On the western edge is the beginning of the Earl’s own house which was never completed and eventually the site changed hands and a Mr Tufnell had numbers 11-14 built there in 1771. By 1815 the Bason and the gravel workings to the north had completely vanished under streets and houses and the whole square had been developed as can be seen in the map to the right. The centre of the northern side has a gap leading to the mews with a turning circle for carriages. The flanking houses still exist, virtually unchanged outwardly, although the gap between them has a link which carries a sculpture by Epstein. The house on the north-western corner (now no.16) was one of the wings of Chados’s intended ‘palace’. It was the home between 1761-80 of Princess Amelia, one of the daughters of George III. Amelia suffered form serious ill-health, including tuberculosis of a knee joint and the painful skin disease, St Anthony’s Fire. She spent much time at Weymouth taking sea water cures. Tragically she fell in love with Colonel Charles Fitzroy (descended from one of Charles II’s illegitimate sons). 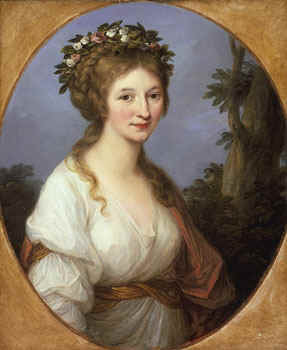 She was not permitted to marry him, but considered herself his wife and left everything to him on her death in 1810, aged 27. In the print below the house is the red brick one on the extreme left. 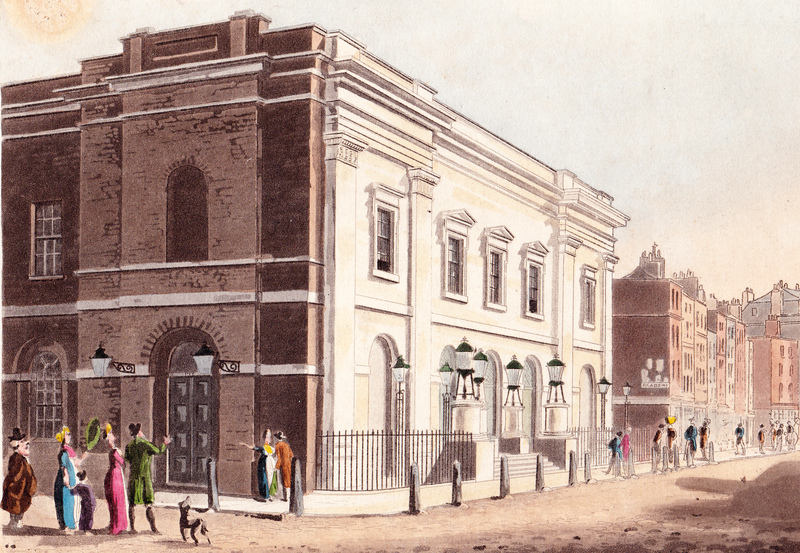 It was ‘modernised’ in the later 19th century so the exterior looks a little different now. Lord and Lady Nelson lived in the Square in 1791 and George Romney, the painter at number 32 on the south side (1775-97). The print of the north side is from Ackermann’s Repository, March 1813. Using Google Street View from the same spot Princess Amelia’s house is still clearly identifiable under later remodeling, a more recent house has been inserted into the space where there is a wall topped with urns and the two houses flanking the entrance to the mews look identical. The circular garden at the centre of the square is till there, but now has an underground carpark beneath it (installed 1971) and the appearance of the square is seriously compromised by the brick wall and entrance lanes of the car park. I’ll be finding more London squares from my collection of Ackermann prints and seeing how they have changed in future posts. “No inhabitant of the metropolis, and scarcely any person who has visited it, needs to be told that the spot delineated in the annexed view [above] forms one of the most agreeable walks in London.” (Ackermann’s Repository October 1810). This shows the eastern end of The Green Park (these days ‘The’ is always dropped) from Piccadilly, looking south. It seems the artist would have been somewhere between Clarges Street and Bolton Street. Westminster Abbey can be seen in the distance and on the left are the houses looking out onto the Queen’s Walk. St James’s Palace is hidden behind them at the far end. Nowadays Green Park tube station would be just out of sight on the left with the Ritz (on the site of The White Horse Cellar) just beyond that. Green Park is a triangular space of about 53 acres. To the south Constitution Hill divides it from the gardens of Buckingham Palace and St James’s Park butts up to it in the south-east corner with the Mall. In the 17th century it was part of St James’s Park, the Tudor hunting grounds, which swept around the south and west of the palace, but by the time of Roque’s map of 1738 the tree lined avenue of the Mall leading up to Buckingham House cut it off and it is labelled The Green Park. The gardens of Buckingham House were much smaller and the park crossed Constitution Hill, occupying the area that is now the large roundabout of Hyde Park Corner. The second print is from The Beauties of England & Wales Vol. 1 (1801) and shows the view west from the southern edge of the park towards Buckingham House which, by that time, had become The Queen’s Palace or House. Before Henry VIII seized monastic properties St James’s Palace was the site of a religious foundation and a leper hospital and the legend persisted that Green Park was so green (and without flowers) because it was the burial place for the lepers. There is no evidence for this! Charles II was responsible for the park’s lay-out and Constitution Hill is thought to be named because it was a favourite walk, or ‘constitutional’ of his. He also built a snow, or ice, house and the mound can still be seen in the park opposite 119, Piccadilly. The park, as well as being a fashionable promenade, was also popular for duels in the 18th century. Count Alfieri fought Lord Ligonier the husband of his mistress there and famously remarked (when he returned from the fight to finish watching the play at the Haymarket Theatre with a wounded arm) “My view is that Ligonier did not kill me because he did not want to, and I did not kill him because I did not know how.” The park was also an excellent location for balloon ascents and firework displays such as the 1814 Peace celebrations. The gravel walk on the eastern boundary of the park is known as The Queen’s Walk and was created for Caroline, the wife of George II. She had a pavilion built for breakfasts looking out on the park, but no trace of it remains. The most distinguished house overlooking the Walk is Spencer House. It can be seen in the top print, identified by the roof ornaments, and in the print below. (1831 Earl Spencer’s House). It is open to the public on Sundays (except in August) by bookable guided tours. The summer of 1814 – and London is en fete to celebrate not only the victory over Napoleon but also the anniversary of Hanoverian rule. For three months Londoners had the opportunity to view, and enjoy, some of the most lavish celebrations the capital has ever seen. On April 20 there was a triumphal procession for Louis XVII from Hyde Park to Grillon’s Hotel in Albemarle Street where he was staying with his entourage. On June 7 the Russian Czar Alexander I, King William III of Prussia, Marshal Blucher, Prince Metternich, the Prince of Liechtenstein, and Prince Leopold arrived in London and on June 11 the Prince Regent entertained all the Allied Leaders at the opera at Covent Garden. On June 16 they were the guests at a dinner held by the merchants and bankers of London in the City and on June 18 the Prince Regent, Marquess of Wellesley, Lord Liverpool, Marshal Blucher, Prince Metternich, Czar Alexander I, and Catherine Grand Duchess of Oldenburg were guests of honour at a dinner given by the Corporation of London. On June 20, hopefully having had the opportunity for a rest and some digestion, the Prince Regent, the Duke of York, the King of Prussia, the Czar and Generals Blucher, Lord Beresford and Hill reviewed 12,000 troops in Hyde Park. At 8pm that evening a re-enactment of the battle of Trafalgar was held in the park on the Serpentine with model ships three feet long (one metre) were deployed to recreate the main events of the battle. At the climax the French ships were sunk as the National Anthem was played. The evening was staged as a popular entertainment and the park was transformed with stalls, arcades, and follies and pavilions. There were refreshments, taverns and fruit stalls and the crowd could listen to military bands as they watched acrobats or enjoyed the swings and roundabouts. On June 22 the Allied Sovereigns watched a naval review at Portsmouth before leaving for the continent, but in London the celebrations were by no means over. On June 28 Wellington was formally welcomed at Buckingham House by the Queen, and on July 1 a great ball was held in the Duke’s honour at Burlington House by White’s Club. It cost £10,000 and amongst the 1,700 guests was Jane Austen’s brother Henry. She was thrilled. On July 7 there was a Service of General Thanksgiving for the victory at St Paul’s Cathedral with Wellington carrying the Sword of State alongside the Regent and as a further sign of his pleasure the Regent held a fete in the gardens of Carlton House to honour the Duke on July 21. August 1,1814 was the hundredth anniversary of the accession of George I of Hanover to the British throne. The Battle of the Nile was represented by rowing boats on the canal in St James’s Park which was crossed by a new ‘Chinese’ bridge with, in the centre, a seven-storey pagoda. According to Ackermann’s Repository “It appeared a blazing edifice of golden fire, every part being covered in lamps, and glass reflectors at proper intervals relieving the splendour with their silver lustre.” At the height of the fireworks the pagoda caught fire and two men and a number of swans perished, but the crowd thought it was part of the celebrations and cheered wildly. Many shops and businesses also rose to the patriotic occasion and decorated their premises. Ackermann’s Repository at 101, Strand, was decorated by a ‘transparency’ almost 30 feet (10 metres) high and “brilliantly illuminated” from the back “with carbonic gas.”. The lower section shows the seven Christian and Cardinal Virtues with the Royal arms above and the standards of the Allied nations. The upper part is the Temple of Peace with the word REGENT above and all crowned with the Prince of Wales’s feathers. It is shown at the head of this post. You can enjoy these two historic parks by taking Walks 4 and 6 in Walking Jane Austen’s London. On Monday 20th Napoleon arrived at Fontainbleu and left again at 2 pm for Paris. He was met on the way by the 1st, 4th and 6th Chasseurs à Cheval an d the 6th Lancers who had been sent to intercept him. Instead of arresting him they presented arms and joined his forces. Bonaparte entered Paris at 10.30 pm without a shot being fired and was carried shoulder-high into the Tuileries, eyes closed, a smile on his face. Perhaps the relieved Londoners who had read that he was in the process of fleeing through France at that very moment flocked to the Adelphi Exhibition in Adam Street, off the Strand to see Robert Lefèvre’s portrait of Napoleon in the uniform of Colonel of the Guard of Chasseurs. A stir was caused on Tuesday 21st by the escape of the quite impossibly colourful Admiral Cochrane from the King’s Bench prison. He strolled into the Palace of Westminster to take his seat in Parliament, from whence he was returned to custody. On the same day anyone still worried about Napoleon would have been reassured by the arrival of the Hyperion frigate in Plymouth, loaded with troops and en route for Holland. 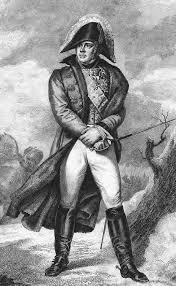 Then on Thursday the devastating news arrived that Napoleon had entered Paris and the King had fled. The 24th was Good Friday, and in his diary Mr Oakes in Bury Saint Edmunds recorded, “This morning the London papers this morning announced the arrival of Bonaparte at Paris on Monday last, 20th Inst, without opposition. Not a gun fired.” The Duchess of Courland reached Vienna the same day to report the King’s flight to the Allies. By Saturday the Congress had acted, ratifying the Treaty of Alliance against Napoleon in which each of the great powers (Britain, Austria, Prussia, Russia) agreed to pledge 150,000 men for the fight. The Duke of Wellington was made commander-in-chief. In London the crisis was having its predictable consequences on the Exchange. Bell’s Weekly Messenger reported “… a close holiday at the Bank, but in the private bargains the Three per cent. Consols, the leading Stock, have suffered a decline of one per cent, reckoning from the closing price on Thursday, and one quarter from the closing price yesterday. 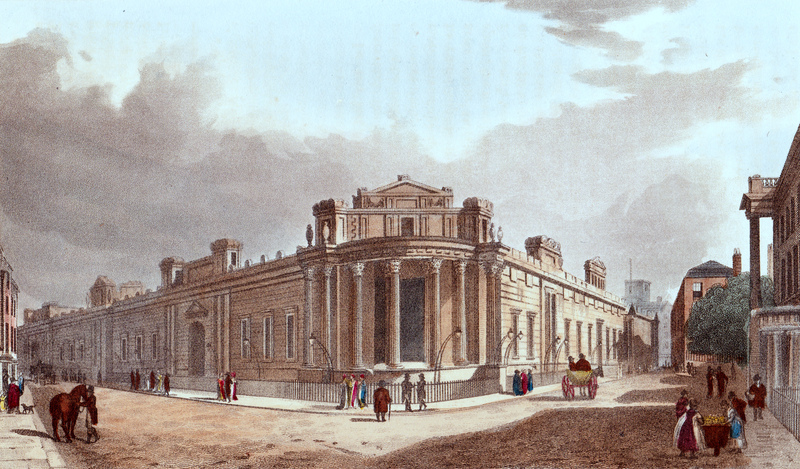 The causes of the depression are to obvious to require specification.” The view above is of te Bank of England in 1809 (from Ackermann’s Repository). It is a view from the north, standing in Lothbury and looking down Princes Street on the right towards Mansion House. While Napoleon held court in L yons, the alarmed Londoners must have fallen on the Sunday papers and would have been lulled into a false sense of security by reports from Paris that Napoleon had received no support following his landing. The weather in France had apparently made telegraphic signals difficult to use, but even so, the French court seems to have been trying to convince itself that all was well. By all accounts King Louis XVIII (left) was driving his advisors distracted by his lack-lustre approach to the crisis. 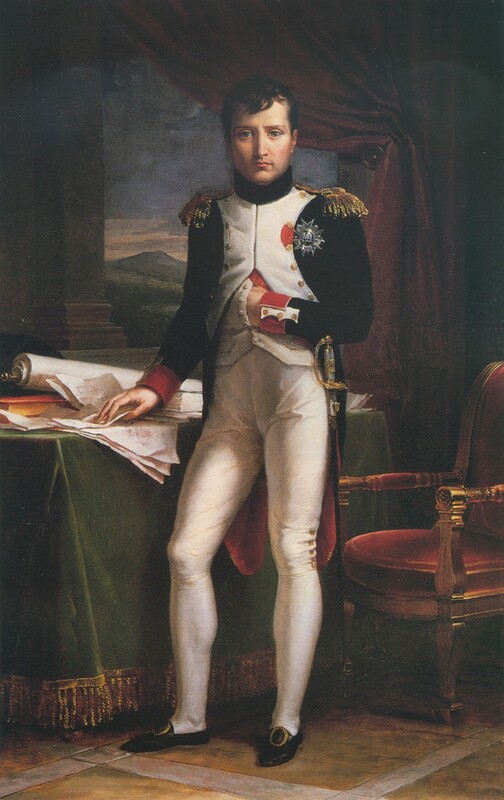 He had either deluded himself that all Frenchmen in their right minds would be ecstatic at the restoration of the Bourbon dynasty and that Napoleon had therefor no hope of securing support, or, more likely, he was simply so lacking in any sort of leadership qualities that he stuck his head in the sand and hoped it would all go away. The date that Napoleon left Lyons is unclear, but the best estimate seems to be Monday 13th, the day that further falsely reassuring dispatches arrived in London. That same day, at the Congress of Vienna, the Great Powers of Europe (Austria, Great Britain, Prussia and Russia) and their allies declared Napoleon an outlaw. The possibility of a peaceful outcome seemed to be fading, especially as on Tuesday Napoleon proclaimed the Bourbons unfit to reign and called on all French troops to join him. Londoners who had been planning a visit to the continent, and who were reassured by the news from the Paris press, might have studied with interest an advertisement for packet boats from London via Gravesend to Ostend. They sailed every Sunday and, potential passengers were assured, took than 24 hours. Private cabins were available. Meanwhile, at Windsor, Princess Charlotte (right) was reported to be slightly indisposed and confined to Cranborn Lodge. She had been visited by the Queen & Princesses from Windsor Castle. 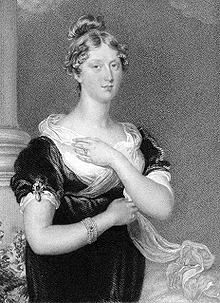 In London the Lord Mayor, as was usual, set the price of a wheaten quartern loaf at 11¾ d and the Earl & Countess of Jersey, one of the influential Patronesses of Almack’s, arrived in London for the Season from their Oxfordshire seat. Business as usual, in other words, and no sign of alarm. On Thursday 1 6th Napoleon reached Avallon where two more regiments defected to his army and, finally, a more realistic report arrived in London from Paris to the effect that all troops sent against Napoleon had joined him, and that he had entered Lyons on 10th March. By Friday, the news was even gloomier – Bonaparte was in Paris, the papers declared, inaccurately, also reporting that the King had fled. Rioting over the Corn Law was reported from Norwich, but spirits rose on Saturday when another falsely encouraging report arrived from Paris. 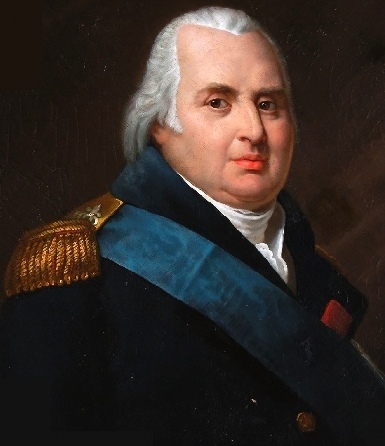 Meanwhile Napoleon arrived in Auxerre where he was met by Marshal Ney (above) who had promised the King to bring the invader back to Paris “in an iron cage.” The two men embraced and Ney rejoined his old commander. 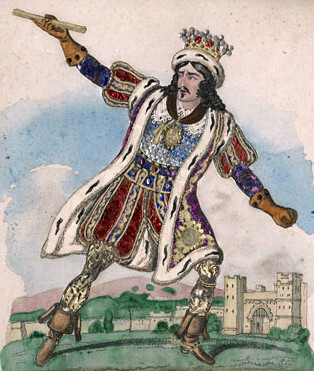 Despite the worrying news, or lack of it, from France, at least there was no rioting on the streets of London and audiences venturing out could be entertained to a rather strange combination of performances at the Theatre Royal, Drury Lane – King Richard III, with Edmund Kean as the king, followed by “A new Farce called ‘Past Ten O’clock & a Rainy Night.’” The print to the right shows Kean in the role and below is a detail of the Ackermann’s Repository plate of the theatre in 1809. The artist must have been standing right outside the Bow Street Runners’ HQ. The theatre is little changed today and you can visit it on walk 7 in Walking Jane Austen’s London.